The Trump administration's new adviser on Iran pressed European allies Wednesday to join the United States in adopting a hardline stance against Tehran, making the appeal ahead of next week's United Nations General Assembly in New York. 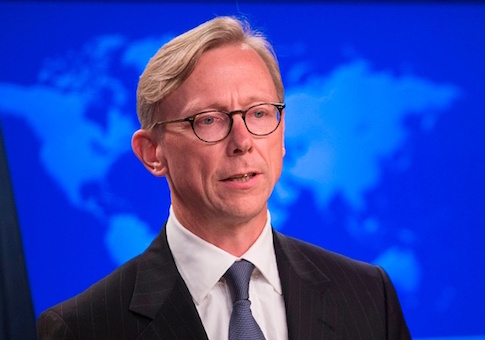 "The reality that U.N. member states ignore at their peril is that Iran has continued to develop and test ballistic missiles," U.S. special envoy for Iran Brian Hook said during an event at the Hudson Institute think tank in Washington, D.C. "We want more nations to join us in confronting the array of Iran's malign activity. We are asking every nation that can no longer tolerate Iran's destructive behavior to protect its people by joining us." European allies were dismayed by President Donald Trump's decision in May to pull the United States out of the Obama-era nuclear accord between Iran and six world powers. The accord sought to limit Iran's nuclear program in exchange for sanctions relief, but administration officials contended it was too narrow and had little-to-no effect on Tehran's malign behavior. Trump is set to lead a session on Iran with heads of state of the United Nations Security Council during the Sept. 26 U.N. meetings in New York. U.N. envoy Nikki Haley said the meeting is meant to further pressure Tehran over its violations of council resolutions, including its ongoing testing of ballistic missiles. "We are working multilaterally to constrain Iran's missile program and bring allies and partners onboard our campaign," Hook said. "We are coordinating with allies to interdict missile related transfers and target Iranian missile proliferation activities in third countries." Secretary of State Mike Pompeo last month formed an organization dedicated to coordinating and implementing U.S. policy toward Iran. Pompeo said the Iran Action Group, led by Hook, is meant to counter Iran's malign activity in the Middle East and elsewhere. Hook said the administration is seeking to negotiate a treaty with Iran that will address both its ballistic missile and nuclear programs. Iranian leaders have so far refused appeals by Trump and Pompeo to meet. "The ayatollah, the president, and foreign minister have all indicated they are not interested in talking," Hook said, referring to Iran's Supreme Leader Ali Khamenei, President Hassan Rouhani, and Foreign Minister Mohammad Javad Zarif. "We respect that, though that does not change our plans. We have a sanctions regime that is underway, stronger measures are yet to come." U.S. sanctions on Iran's oil sector are due to snapback Nov. 4.